Are you always looking for a new salad idea?! 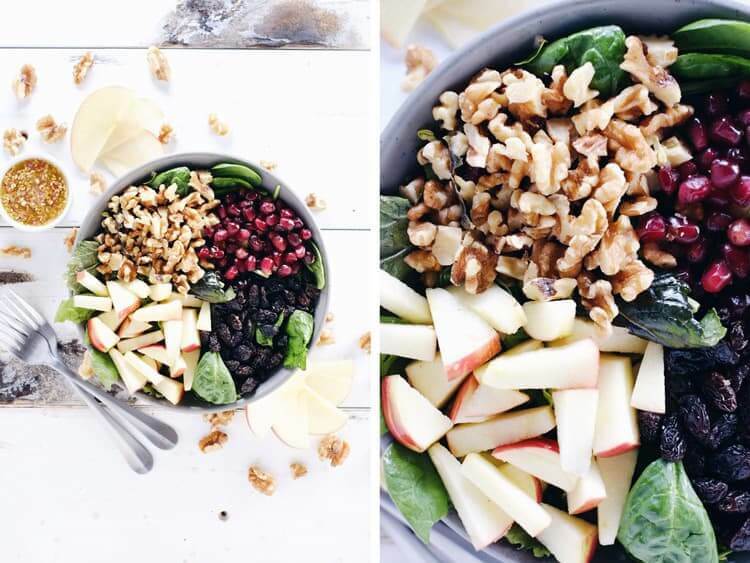 This apple walnut spinach salad is just for you! One really great way to make lunches during the week a breeze is to make a large salad and a couple different proteins. Then, top the salad with different proteins each day, and it will feel like a totally different salad! You won’t get bored, feeling like you’re eating the same thing everyday, and you’ll get lots of greens in! Score! 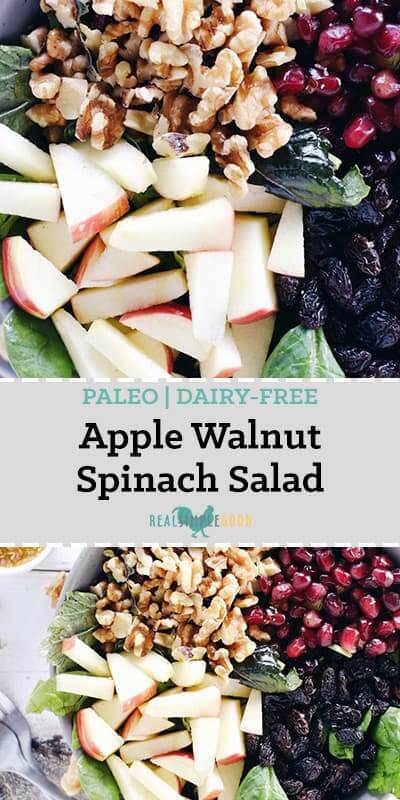 Once again, Justin has created a flavor punch with the dressing for this apple walnut spinach salad! It has olive oil, shallot, apple cider vinegar for a little acidity, honey, coconut aminos and toasted sesame seeds. It is so tasty with a hint of sweet and notes of Asian flavors. You can toss it with your salad right away and serve, or hold the dressing if you’re planning to make the salad over the weekend for the upcoming week. Then, just use a little each day with your salad so your salad doesn’t get soggy. 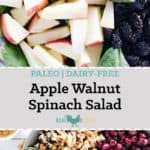 Just pair this apple walnut spinach salad with your favorite proteins to make it a filling and complete meal. It goes especially well with chicken or tuna salad, leftover steak and salmon. 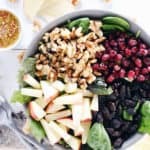 If you have leftovers on hand or can make a couple of different proteins over the weekend, you’ll be able to make this salad feel a little different each day by varying the protein you pair it with. No boredom, just lots of flavor and plenty of greens! 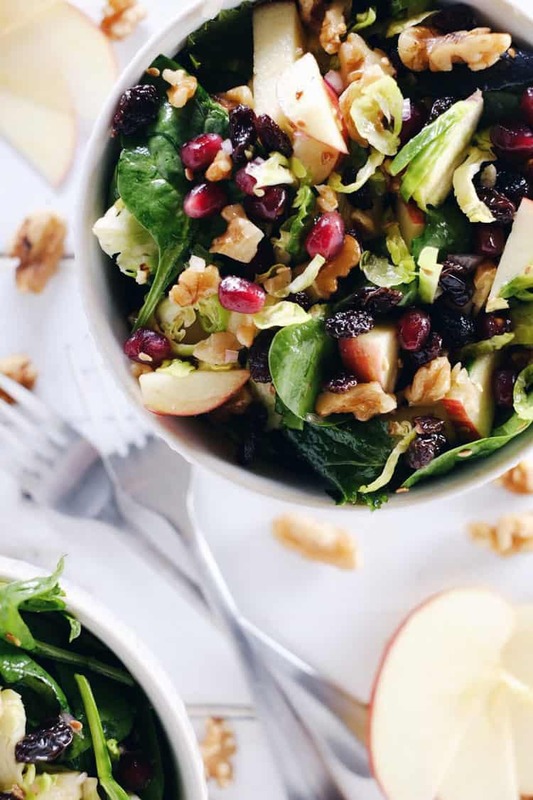 Go for it, and make this apple walnut spinach salad this coming weekend, and then pair it with your favorite proteins for lunch the following week! Let us know how it goes by leaving a comment below. Also, take a photo and tag us on Instagram @realsimplegood, so we can check it out! Combine all of the salad ingredients in a bowl and toss to mix. Make dressing by adding dressing ingredients to a small bowl or jar and mixing well with a whisk. Toss salad with dressing to coat. Note: To toast sesame seeds, simply add them to a small saucepan over medium-high heat. Stir them frequently to prevent burning and cook until golden brown. Serve as a side salad or add some protein on top for a complete meal. 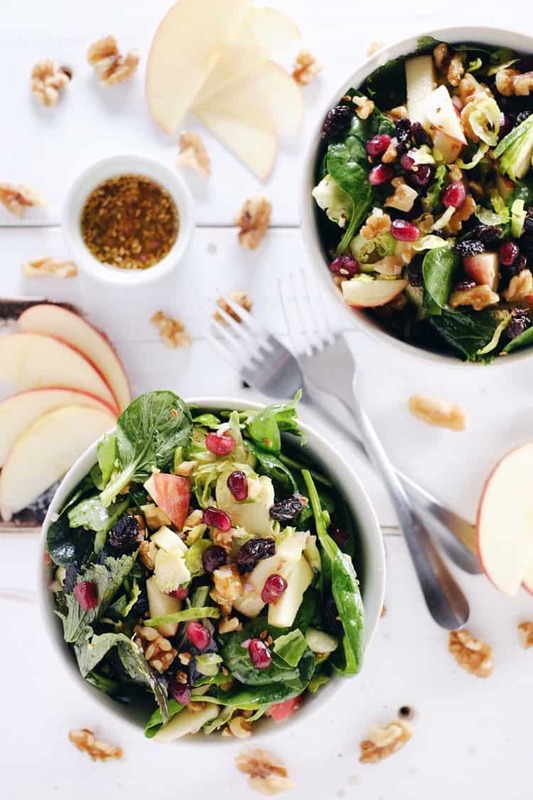 My family makes a similar spinach salad during the holidays, but yours has a lot more goodies in it, and the dressing sound so good, (I’m intrigued by the coconut aminos which sounds like a fantastic idea to me). I can’t wait to try this out! Thanks Kari! The dressing adds so much unique flavor. You’ll like the coconut aminos and sesame seeds in there! Hope you enjoy! Can’t believe it is almost the holidays again!